Today’s customers expect a seamless experience as they research, engage and purchase across mobile, web and physical store locations. Successful retailers have put customer retention, marketing, and back-end IT systems in place to make sense of these behaviors in order to enhance the customer experience. Many retailers are using localization, applying the unique nature of specific locations to reflect the product or service being offered, to integrate messaging and operations across these channels. What is localization? In this context, it is using local market characteristics to place the right products at the right price in the right store at the right time. It requires location-specific planning and execution strategies across departments included targeted marketing, sales, merchandizing, store operations and distribution. This movement uses data-driven processes and solutions, including gathering and analyzing local customer demographics, to better understand what needs to be offered in each location. Retailers do this in hopes of getting marketing, distribution, merchandizing, e-commerce and brick-and-mortar retail operations all working in harmony. Despite spending hundreds of millions of dollars, many times, the results haven’t lived up to the hype. Why is this? One reason is that retailers have missed one fundamental element, the location in localization. 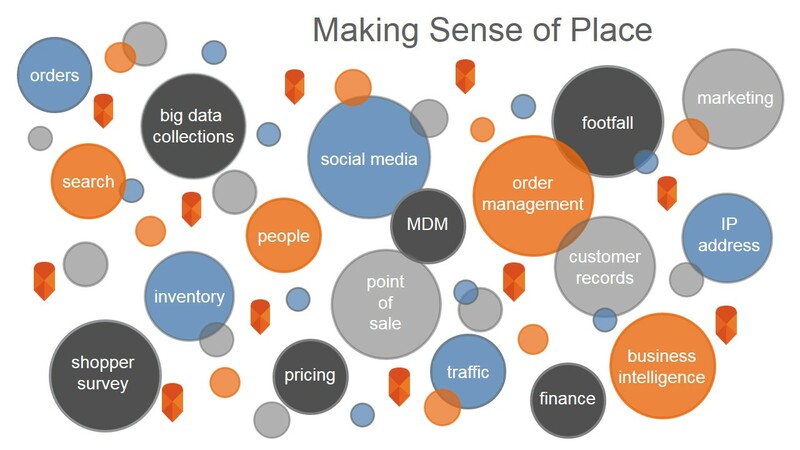 For all the focus on integrating demographics, merchandizing, transaction history and store size and format, none of these systems have been designed to truly create, manage, and share location-based insight. Merchandizing and marketing are defined by demographics. Hyperlocal marketing campaigns are tailored to store catchment. Optimizing distribution saves money and time. Retailers need to ensure the right product at the right place, right price, and right time. Behind every component of localization is location, used in context. Context adds new understanding and connects the customer across the entire shopping experience, from a device, to the Internet, to the brick and mortar store. If used correctly, location can help guide a customer from product evaluation and buying to postsale customer service and relationship management. Take a look at the map above depicting customers in the Washington, D.C. Metro area. The background heat map is a predictive surface showing where we would expect to find the best customers, based on past purchasing patterns and the likelihood of all customers to respond to a campaign. The larger the circle, the more likely the chance that segment will buy the product. Not only can we understand how past response varied by geography, but we can also quantify the factors that influenced that, such as the customers’ access to and distance from retail centers, as well as demographics, psychographics, and travel patterns. These can be based on any time window, time of day, day of the week, week of the year, holidays and date ranges. All customers, transactions and interactions become points that influence the predictive surface and customer affinity scores, changing in real time as current customer behavior and past experience merge. Every transaction, customer’s home address, IP connection for an Internet search, social media post, product delivery, and even lost sale and missed opportunity can be located somewhere. Imagine the possibilities when you go from simply mapping some of the sources of data depicted below to combining them and applying quantitative insight at the point of execution. Despite this, location is not always at the heart of a retailer’s business activities; merchandise assortments are often too granular and don’t match the true customer trade area. Similarly product planning and marketing are done in macro geographies like metropolitan statistical areas (MSAs) or neighborhoods, and can be most successful when analyzed at the activity and transaction level, not in aggregate. Retailers need to change this if they are to meet the demands of today’s consumers who have new expectations about purchasing, product availability and home delivery, thanks to mobility and omni-channel retailing. Location as a Service (LaaS) is a new concept that combines the three main categories of cloud computing services: infrastructure, software, and platform as a service. Location provides a platform to develop, run, and manage analytics and embedded applications without needing to build analytics and data maintenance infrastructure into other enterprise apps and systems. LaaS is the best infrastructure to manage, store, and share location specific capabilities between different departments and organizations. It’s a service provisioned to be available via subscription and scaled on demand. LaaS delivers software and apps on a centrally hosted, subscription basis that can be used by the entire organization anywhere, anytime, and by anyone. LaaS provides a way to more widely leverage location so you can understand data through knowledge-focused workflows and on-demand analytics and provide insight. Take the ways customers interact, through social media, online, via email, coupons at the store and with salespeople. Fine tune this messaging holistically by understanding not just the who and what but also the why and where. Using location-centric strategies, retialers also find out who they are missing and reach these people when and where they are most receptive. LaaS makes location analysis an executable methodology within a retailer’s core functions, delivering new value and extending the focus of other business systems such as BI, CRM, marketing automation and supply chain solutions. Ultimately, LaaS becomes an underpinning of strategic and operational activities, scaling on-demand analysis to meet day-to-day challenges and needs. The unique value proposition for LaaS is that it doesn’t just work within other systems, it is a system, the system to deliver new forms and types of retail understanding.